i’m a little confused at #7, the part with wrapping the elastic. can you explain it just a little more please? i just looked at the picture again and think i got it! whoops! i can´t understand how you wrap the elastic and join both parts.. Please, help me.. I want to try this! Its just a case of putting an elastic over the centre of the material so when you flip the material over, it gives you the gathered look. To attach the top and bottom piece of fabric together, you are basically just tying the top and bottom together using the fringes you made to do this. Thats how there is no sewing involved. I think this is a great idea cause we know how often we have to replace our dog beds and the cost is unreal so this is a perfect idea and the fact its made with your old or used clothes is perfect for the dog because thats all they want, is the smell of their owner!! I just used a strong rubber band. Gather it together in the middle of one piece of fabric. Wow, this sounds awesome! Can’t wait to try it! 🙂 Thank you so much. I don’t understand the wrapping with the elastic either. Could you add a picture to it? Thank you! PS I love your poodle! Thanks very much ladies : ) In regards to step #7 let me try to re-explain : Take a fist full of fabric in the center of one of your cut circle and tie an elastic around it ( so its like if you were doing a pony tail in the middle of one of your cut circle – if that makes sense ? ) . I hope this helps ?! Fabulous pet project! I will be doing this next weekend for sure! Thank you! Not sure how to do the elastic on the no sew dog bed using fleece and old clothes for stuffing. Just read your explanation. I understand. Making mine today!!! How do you wash the bed? especially with old clothes for stuffing? Does it wash ok? Hi Jenny, to wash my dog bed : I simply untie a few knots from the side and pull all the stuffing out and put the bed cover in the washing machine. Oh and I also remove the elastic in the centre to let it dry properly. I think the elastic gives it the gathered effect on the top that fans out from the center. It’s a look, certain it would be fine with out! do you think this would work for a rectangular shape? Looking forward to making this and I agree with Erin…so many beds out there are just plain ugly! Great Job…btw what kind of dog is Luigi? Thanks Diana, Luigi is suppose to be a mini poodle – but we really don’t know since he is a rescue. he looks just like my dog, an adopted cocker-poodle mix (supposedly, he was also adopted) only bigger. Hi Elizabeth, the size given above is for a medium size dog. Perhaps you could double the size for an extra large bed. love this! what an easy way to make a new cover for the dog bed you already have! HI… QUICK QUESTION…Just to make this clear..you used 1m x 1m & folded this into 4 squares..so your 4 folded squares ended measuring about 20in? I feel like when I proceed to cut my cirlce..it seems like mine is very much smaller than your picture…? I just want to be sure before I start cutting lol! & once I draw & cut my circle..this WILL end up cutting into ONE big circle..not multiple circles like I seems? okay yes lol i ended up with 4 very small cirlces! & only from one square! so folding it in 4 is irrelevant for cutting a circle!? another words..i should just cut a circle out of my 1m x 1m square..not folding it in 4 and then fringe and tie and stuff!? The reason you fold it in four is so that you’ll end up with a circle that is symmetrical. You fold your fabric in half and then fold it in half again, then draw an ARC, not a full circle. You can then just cut along the arc (with the fabric still folded) and it will be a circle when you unfold it. You could also just cut a circle out of the big piece of fabric but many people (myself included) find it hard to do. I am so excited about this project, I’m going to make this weekend! cool. im so gonna do this. thanks!!! Hi Sally, I will redo this post for a magazine with professional photos of each steps- so I will update my post as soon as it’s done 🙂 Hopefully you get a better idea on how to do it! awesome project for my girls (15yrs & 8yrs) to make during the Christmas Break!! They will be cleaning out their closets and can use their old worn out tshirts as the fillers…. the plus side of this their labradors will love that their “mommas’ scent is on their new beds!! Can’t wait for them to do it!! Is this good for dogs who chew beds? Or would you recommend something else? Hi Jocci, I don’t think that such a great idea for dogs who chew beds. I would recommend making one with heavy duty fabric. Ha! Jocci, your post made me giggle. Now, though, since she SEEMS to be out of the bed-destroying phase, I am hoping to try the DIY approach to bedding after spending a slight fortune for dog beds. I may try turning the fabric inside-out after tying (before stuffing) to discourage her from chewing the tassels. We’ll see how that goes! Good luck with your chewbacca! Oh that’s a good idea, thanks a bunch! I will try it and see how it goes! this is a perfect project to make a short video… it will be much easier to follow. Especially for all of us visual learners!!!!! I love this idea , good work! It has so many possibilities! Old towels or blankets & sheets would work well for stuffing too! I have a 110 lb lab. How much will I need to increase the size to suit his size? what size is 1m x 1m?? great idea! i bought 2 of the fleece kits a couple years ago from a local fabric/craft store. i’ve used them as just blankets to cover with. your idea is the same concept except with stuffing. i like it! i’m going to take one of the two tied fleece throws, untie one end & stuff with old t-shirts. thanks for the idea to repurpose something i already owned! Great idea, thanks! I am thinking of making a square one with a continental pillow used for the inside. I created a scrapbook cave in my garage this past weekend. This weekend I am planning to make a new dog bed for my little furry girl to enjoy in the cave while she hangs out with me. I love this bed and think adding her name with the wool roving would look awesome! Thanks for the idea and the link to the instructions! I love Melanie’s idea with the wool roving. It’s easy to do and looks beautiful. If you tie square knots I think the stuffing will stay put. Strips of old tshirts or towels work for stuffing too. I’m going to look for some kind of denim quilt at goodwill and work with that. I have a 75 lb. German Shepherdthat sheds a LOT in the spring and most of the summer and denim would be easy to clean and doesn’t attract the hair like fleece will. I made this in a much larger size (for my 110 lb APBT) and he loves it… I just have to constantly pick up fluff that he seems to be able to pull from the spots between knots lol. It was an easy project and I always have people compliment it and ask me where I got it! What measurements did you use? I’m planning to make one for my lab and would need a bigger size. Love this bed! We ran across this great idea for making a dog bed. There are two things about this that passed our “do we love it test”. First, you can upcycle your old clothes or linens which means you get a cleaner closet and your pooch gets to feel close to you even when you’re not around. Second, this is a no sew project! A lot of people have a poor relationship with their sewing machine, so for this project you don’t have to fight with it! 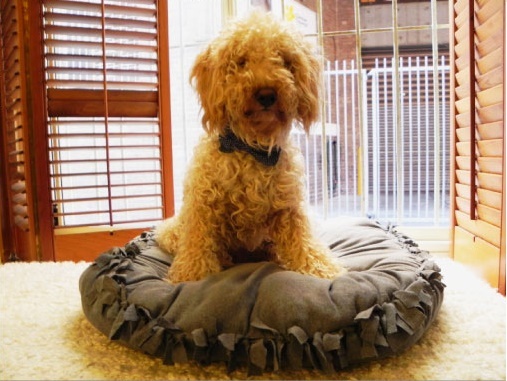 Thanks for sharing this wonderful idea for a homemade dog bed! 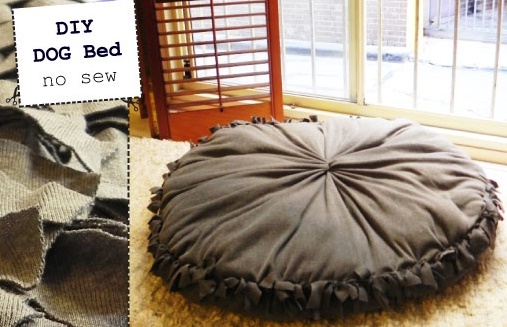 This is the answer to my quest for the perfect, stylish, budget-friendly dog bed for the puppy are expecting this Spring! You are a very crafty lady! God bless! Fabulous idea!! I also want to commend you for your patience. I love this bed! I can’t wait to get started. I have always made the ones that are tied but never in a circle. I am sooooo Excited for the round one! Thanks for sharing. I just made this for my dog but used a black fabric that was sort of like polar fleece but had raised polka dots on in in all black. I used a a little over a yard of fabric and made it more rectangle. To stuff, I used two large pillow inserts that I already had. This might work better as no stuffing will come out of the sides. Plus easier to pop those out to wash. The black bed goes well with my Living room decor where she plays on pillows with her stuffed toys. I might make another one in white to use in the bedroom where she sleeps at night. I wonder if you could tie most of the fringe, then turn it inside out so the fringie ends were inside, then stuff. You’d put the elastic on the other side, of course — but that would slow down dogs who want to chew on fringe. Awesome! I understood it very well. Love the idea. Dnt have a dog but my kids would love this as lil floor pillows ty! My elderly English Bulldog is going to be THRILLED! I’m just not willing to spend the crazy money on dog beds, but with a Hobby Lobby coupon this is CHEAP!! Thanks! I think it’d be easier for me if I saw a video also, how long should the elastic be? saw this on pinterest. Found 2 old blankets and old clothes. Within an hour I had a dogbed! Now I have to make two more… For the other dogs. What a great idea this bed! Just made this for my Boxer/Husky mix, Moxi. She LOVES it. I used a combination of pillow stuffing and old tshirts and stufffed it about halfway. She likes the extra room in the bed to burrow into. Thanks so much for the great idea!